In an earlier post we took a very brief look at some of the new properties of the SYSTEM object, and this time we thought we’d take a closer look at one of it’s new methods called LOG_EVENT. <1> Message Type (Required) : "ERROR", "WARNING" or "INFO". 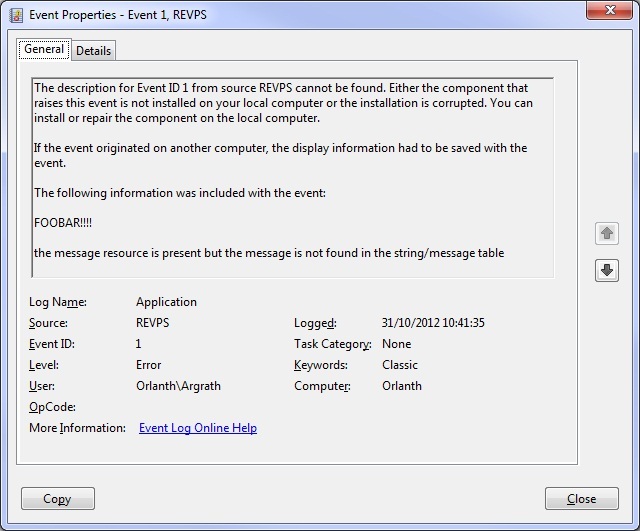 <2> Event ID     (Optional) : Integer denoting the event. Defaults to 1. <3> Category ID  (Optional) : Integer identifying the category. Defaults to 0. <1> Event Source (Required) : Name of the Event Source (See below). <2> Server Name (Optional)  : UNC Name of the system to post the message to. Defaults to the local workstation. 3) Message Text: This is simply the text of the message to post to the Event Log. The reason for this is that Windows expects to find a “registered Event Source” containing the description for the Event ID that you specified. A registered Event Source is actually a DLL containing a set of strings, each of which corresponds to an Event ID. Without this DLL you get the warning text you see above which doesn’t look very professional and gives the impression that something is missing from your application. 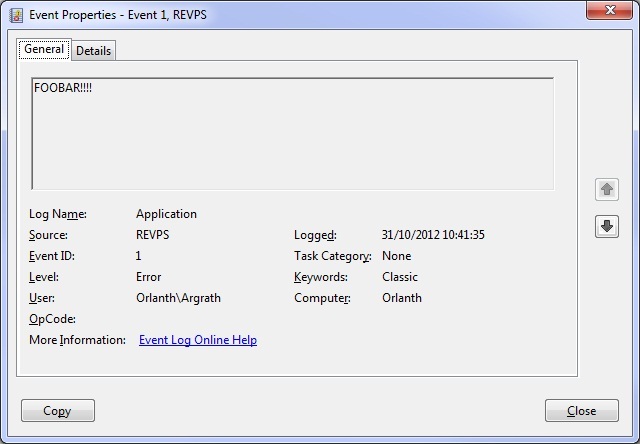 For OpenInsight v10 we have provided a generic DLL called RevEventMsg.dll that you can register on your system under your desired Event Source name – if you then use that name in your call to the LOG_EVENT method you will see your message without any of the warning text prefixed to it. This entry was posted in Presentation Server and tagged Methods, SYSTEM on November 12, 2012 by Captain C.